Musculoskeletal disorders (MSDs) were recognized as having occupational etiologic factors as early as the beginning of the 18th century. However, it was not until the 1970’s that occupational factors were examined using epidemiologic methods, and the work-relatedness of these conditions began appearing regularly in the international scientific literature. Since then the literature has increased dramatically; more than six thousand scientific articles addressing ergonomics in the workplace have been published. Yet, the relationship between MSDs and work-related factors remains the subject of considerable debate. 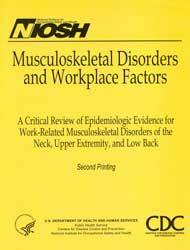 Musculoskeletal Disorders and Workplace Factors: A Critical Review of Epidemiologic Evidence for Work Related Musculoskeletal Disorders of the Neck, Upper Extremity, and Low Back will provide answers to many of the questions that have arisen on this topic over the last decade. This document is the most comprehensive compilation to date of the epidemiologic research on the relation between selected MSDs and exposure to physical factors at work. On the basis of our review of the literature, NIOSH concludes that a large body of credible epidemiologic research exists that shows a consistent relationship between MSDs and certain physical factors, especially at higher exposure levels.